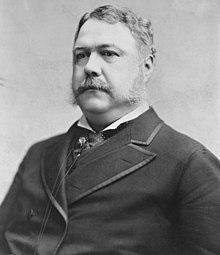 Chester Alan Arthur (October 5, 1829 – November 18, 1886) was an American attorney and politician who served as the 21st President of the United States (1881–85); he succeeded James A. Garfield upon the latter's assassination. At the outset, Arthur struggled to overcome a slightly negative reputation, which stemmed from his early career in politics as part of New York's Republican political machine. He succeeded by embracing the cause of civil service reform. His advocacy for, and subsequent enforcement of, the Pendleton Civil Service Reform Act was the centerpiece of his administration. What a pleasant lot of fellows they are. What a pity they have so little sense about politics. If they lived North the last one of them would be Republicans. As quoted in Recollections of Thirteen Presidents, John S. Wise (1906). The office of the Vice-President is a greater honor than I ever dreamed of attaining. As quoted in Random Recollections of an Old Political Reporter, William C. Hudson (1911). Honors to me now are not what they once were. Written on the death of his wife, Ellen. As quoted in Gentleman Boss: The Life of Chester Alan Arthur, ch. 8, Thomas C. Reeves (1975). Indiana was really, I suppose, a Democratic State. It has always been put down in the book as a state that might be carried by a close and careful and perfect organization and a great deal of— [from audience: “soap,” in reference to purchased votes, the word being followed by laughter]. I see reporters here, and therefore I will simply say that everybody showed a great deal of interest in the occasion, and distributed tracts and political documents all through the country. The remarks concerned the presidential election of 1880. As quoted in The New York Times (12 February 1881). The extravagant expenditure of public money is an evil not to be measured by the value of that money to the people who are taxed for it. Veto message of Rivers and Harbor Bill (1882). I trust the time is nigh when, with the universal assent of civilized people, all international differences shall be determined without resort to arms by the benignant processes of civilization. Veto message of Chinese Exclusion Act (1882). Madam, I may be President of the United States, but my private life is nobody's damn business. Quoted in Gentleman Boss: The Life of Chester Alan Arthur, ch. 8, Thomas C. Reeves (1975). This page was last edited on 17 March 2019, at 12:29.